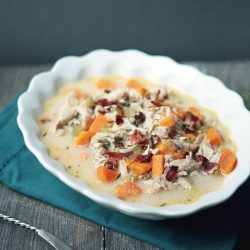 Put those turkey leftovers to good use in this delicious low carb and gluten free turkey chowder recipe flavored with bacon and cheddar cheese! Chop the raw bacon into 1 inch pieces. Brown the bacon in a medium saute pan until slightly crisp. Remove about 1/4 cup of the bacon, crumble and set aside for garnish. Add the shallots and celery to the bacon and grease in the pan, cooking until soft – about 5 minutes. Add the turkey stock, whipping cream and shredded cheddar cheese, whisking until melted and mostly smooth. Carefully add the sweet potato, turkey, parsley, and liquid smoke. Simmer about 20 minutes or until the potatoes are tender. Whisk in the xanthan gum and cook for 5 more minutes or until slightly thickened. Stir in the fresh thyme, and season with salt and pepper to taste. Serve hot, garnished with cooked bacon and more fresh thyme leaves.